Dubai’s Emaar Properties plans to build a new tower in the emirate to surpass the height of Burj Khalifa, currently the world’s tallest building, according to chairman Mohamed Alabbar. The estimated $1-billion project – The Tower in Dubai Creek Harbour – will serve as the vibrant core of Dubai Creek Harbour, a 6-sq-km world-class masterplannned development that will be two times the size of Downtown Dubai and located 10 minutes from the Dubai International Airport. It is also in close proximity to the Ras Al Khor National Wildlife Sanctuary, protected under the Unesco Ramsar Convention and home to over 67 species of water birds. Supported by a matrix of cables, the futuristic tower will anchor the redevelopment of the Dubai Creek, the heart of old Dubai where traditional dhows continue to ferry goods. HH Sheikh Mohammed bin Rashid Al Maktoum, Vice President and Prime Minister of the UAE and Ruler of Dubai, chose the design by renowned Spanish/Swiss neo-futuristic architect, structural engineer, sculptor and painter Santiago Calatrava Valls, from a competitive international design pitch for this new landmark. 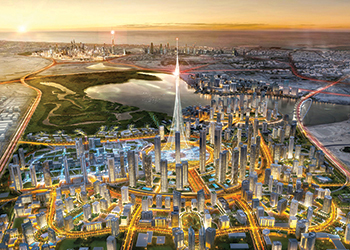 Alabbar does not confirm the height of the proposed new tower, saying only that it will be “a notch” taller than the Burj Khalifa, which stands at more than 828 m.
“A shining beacon of hope for the world, celebrating diversity and human achievements, this new iconic landmark further highlights the country’s ambition and futuristic vision and enhances our nation’s pride. It will be the destination for the world to visit, enjoy and celebrate life, as Dubai prepares to host the Expo 2020,” he remarks. He says the design integrates not just design excellence but also strong environmental and smart-tech considerations. Valls says the design has clear reference to the classic art from the past and the culture of the place while serving as a great technological achievement. Valls’ accomplished works include the World Trade Centre Transportation Hub in New York (US), Calgary Peace Bridge, the Olympic Sports Complex in Athens (Greece) and the Turning Torso Tower in Malmö (Sweden), which was recently awarded with the Ten Year Award from the Council on Tall Buildings & Urban Habitat (CTBUH), among others. The Tower at Dubai Creek Harbour draws design inspiration from the lily and evokes the image of a minaret, which is a distinctive aspect of Islamic culture. The elongated oval-shaped bud and geometric texture set the template for the observation decks. The slender stem serves as the analogy for the structure, which is engineered to its most efficient diameter. It is linked to the ground with sturdy cables, in turn inspired by the delicate ribbing of the lily leaves. The cable array gives the structure its strength, anchoring the ‘bud’ securely to the ground with technical precision using modern engineering materials. Offering 360-degree views of the city and beyond, the crowning glory of The Tower will be The Pinnacle Room opening to grand views of the sky. The VIP observation garden decks recreate the splendour of the ‘Hanging Gardens of Babylon’, one of the Seven Wonders of the Ancient World. Touted as an engineering marvel, the piece-de-resistance of the tower will be fully-glazed balconies that extend outward and rotate outside the skin of the tower. The development will also have a world-class boutique hotel for visitors. The design will be finalised following elaborate wind tunnel testing and all mandatory seismic testing. “Every aspect of The Tower is designed and being developed to the highest international standards of safety – from the choice of materials to the technology being used. All local government codes and regulations will be adhered to with close co-ordination and guidance from the concerned authorities,” says a spokesman for Emaar. The Tower takes into consideration environmental and sustainability features that will serve as industry benchmarks. “It starts with the thoughtful design and an environment-friendly tram service to be integrated for effortless access. On-foot visitors have a multitude of access points on to the plaza. A number of green corridors are envisaged for pedestrian access and effortless connectivity with Dubai Creek Harbour,” he says. The Tower will sit in the middle of a development that will contain a 4.5-km boardwalk, 11.16 million sq m of retail space, 6.79 million sq m of residential space, 22 hotels, 851,000 sq m of commercial property and a yacht club and marina. The building is expected to be completed in time for the Dubai Expo trade fair in 2020, the same year that the kilometre-high Kingdom Tower in the Saudi city of Jeddah is due to overtake the Burj Khalifa as the world’s tallest building. Funding for the $1-billion project will be 50 per cent equity and 50 per cent debt, Alabbar says. Meanwhile, Emaar has unveiled high-end residences in Dubai Creek Harbour including Dubai Creek Residences, Creekside 18, and most recently, Harbour Views homes in The Island District, a vibrant lifestyle hub. All homes open to premium views of the Dubai Creek, a stylish marina with a yacht club, the Ras Al Khor sanctuary and the skyline of Downtown Dubai. The residences also open to the views of The Tower. The bustling Creek Boardwalk envelopes the Island District, with nearby amenities including event spaces, galleries, water features and a trendy Vida hotel.